according to my imagination: pogs. I use to collect pogs, I had so many it was crazy. It's so cool to see things that bring back memories from our child hood. aww thats awsome! 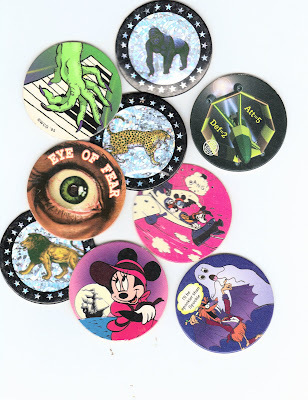 i was a little too young to catch onto the whole pogs craze, i found a whole shoebox full of them in this op shop and i only picked out a handful - i severeley regret not buying the whole box! i stick them on everything! I love pogs! I had so many, and I also have no idea where they are now. My dad probably threw them out when I left for college! To answer your question on my blog...our town USED TO grow peanuts but unfortunately when the railroad when re-routed the farmers found it too expensive to move them by truck, so they moved elsewhere. Before that we were the Peanut Capital of the world. We still have the peanut festival though, why change it after so many years. Have a great day!